The island nation of Tuvalu is offering two commemorative coins in honor of "Star Trek." The voyages of the U.S.S. Enterprise now include a stop in Polynesia. The tiny island nation of Tuvalu is issuing two commemorative coins to honor the legacy of the original "Star Trek" TV series of the 1960s. The beaming visage of Captain James T. Kirk (played by William Shatner) graces one of the coins, while his famous starship, the U.S.S. Enterprise is on the other one. Both images are in full color and include other "Star Trek" references, such as the logo of the United Federation of Planets. "Since its debut, 'Star Trek' has developed into a cult phenomenon with a range of spinoff television series and a number of feature films being released over the past five decades," wrote Perth Mint Australia representatives in a news release. 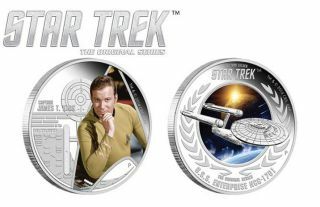 If purchased as a set, the limited-edition coins come with Starfleet-worthy packaging: a "Star Trek" transporter machine which lights up when the lid is opened," representatives with the Perth Mint added. The coins are also available as individual purchases inside 'Star Trek'-themed boxes. "Star Trek," based on a concept from Gene Roddenberry, aired on network television between 1966 and 1969. The series was meant to follow a five-year voyage of a starship and starred Kirk, Spock (a Vulcan alien played by Leonard Nimoy) and Leonard "Bones" McCoy (a doctor played by DeForest Kelley). The series became immensely popular in reruns and was noted for breaking new ground in a few ways, including an interracial kiss. The cast returned in "Star Trek: The Motion Picture" in 1979, with most members reprising their roles across six films. Shatner starred in a seventh film in 1994, "Star Trek: Generations." Nimoy made two appearances in a rebooted movie version of the Original Series, which beamed up films in 2009 and 2013. Another "Star Trek" movie is expected to hit theaters in 2016. Several other television series spun off from "Star Trek" in the 1980s, 1990s and 2000s. While there is no network-backed 'Star Trek' series on the air right now, several fan productions are ongoing.